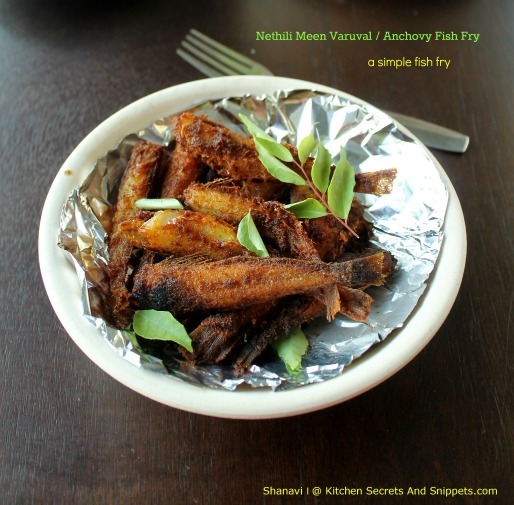 My love for mutton and sea foods are never ending, just love them to the core, so this day am going to post a simple anchovy fish fry which tastes OSM for sambar, curd rice, if you ask me, it tastes delicious as such..Finger licking fry. Try this and enjoy your Sunday with this simple fry as side dish. Add the turmeric powder, red chilli powder, Salt, fennel seed powder, oil (1/2 tsp) in a bowl, mix well using a spoon and make a thick paste. Finally add the lemon juice and combine well with the paste. Now dump in the fish and thoroughly marinate the fish with the masala paste , cover and keep inside the refrigerator for at least 2 hours. Heat the oil in a dosa pan / shallow pan and place the fish when the oil is hot. Fry the fish for a minute on one side and flip the fish to the other side and cook until it gets cooked and looks golden brown. 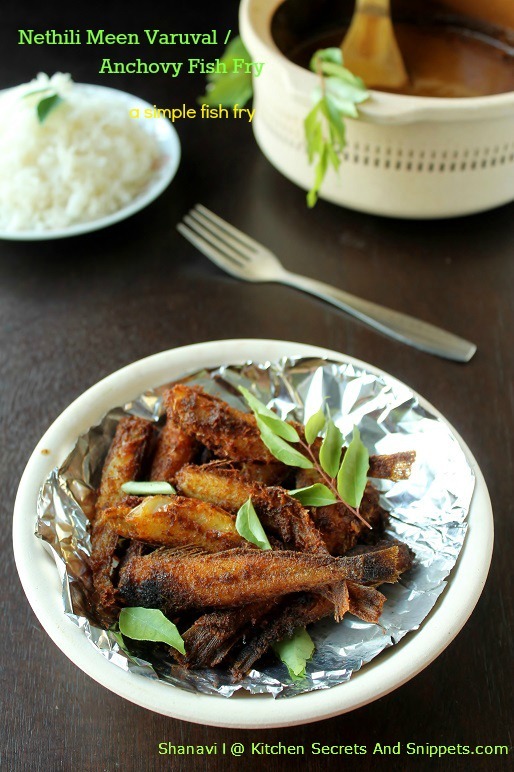 Drain the fish and place in a paper towel, fry the curry leaves in the remaining oil and sprinkle generously on top of the fish fry and serve hot. beautifully done,i could have it all. Ooooh SHanvi ...u r making me drool over this early in the morning. This will get vanished in a jiffy if i make this here...our fav. I'm drooling looking at this dish. Wow so so tempting and delish it looks. i can have even 50 nethili pieces a day :) i'm such a big fan of nethili fry.. nice preparation..